CHICAGO (AP) -- Hundreds of Midwest manufacturers stand to benefit from a web of high-speed passenger rail routes emerging from Chicago's rail hub, according to a report released by an environmental policy group that has fought to defend the use of billions in taxpayer money on such projects. The report released Friday by the Chicago-based Environmental Law & Policy Center found that 460 manufacturers in seven Midwest states are poised to reap new business, along with a dozen more highly visible companies that make rail cars and locomotives. Those additional supply-chain manufacturers make everything from seats, couplers and bolts to ceiling panels, interior lighting and air horns. They also cut sheet metal, provide electronics and communications equipment, and supply track maintenance machinery. "What we're seeing is that old-line Rust Belt manufacturers are making the equipment for modern new rail cars," the group's director, Howard Learner, told The Associated Press. He said the "extraordinary" number of companies they found in the supply chain was nearly double what he expected. Supply-chain companies in Minnesota, Wisconsin, Iowa, Illinois, Indiana, Michigan and Ohio stand to benefit from high-speed rail. "It shows that the federal investment in high-speed rail modernization is good for manufacturing jobs, good for economic growth and good for the environment," Learner said. Critics of the high-speed rail projects set in motion by President Barack Obama in 2009 with the help of $8 billion in stimulus money say they are expensive boondoggles. Opponents and skeptics include members of Congress, governors, policy experts and even some in the rail industry who doubt any of the planned routes will become profitable, especially given the political pressure to keep fares low. As a result, they argue, taxpayers will be on the hook for years to help provide subsidies to keep the projects up and running. Kristina Rasmussen, vice president of the Illinois Policy Institute, rejected the notion that the new report provided evidence that the high-speed rail program would ever be a genuine and sustainable driver of economic growth. She said the businesses named were merely benefiting from what she called the government's shifting of taxpayer money from one industry to another. "We can't trust the government to pick winners and losers," Rasmussen said. "... Remember all of the businesses and industry that won't have capital available because some politician took it away through higher taxes or borrowing and spent it on a politically favored group like high-speed rail." Work on the Midwest program spreading out from Chicago already has sped trains up to 110 mph on at least some segments of the routes to Detroit and St. Louis. For now, those trains must share track with freight traffic, but studies have looked into the possibility of building a dedicated track that would allow for faster passenger service. There are also projects on the East and West coasts, including a planned $68 billion high-speed rail system to link Northern and Southern California by trains traveling up to 220 mph. Obama and many federal and state transportation officials say the projects will reduce pollution, lessen U.S. dependence on foreign oil and create jobs. In Illinois, Gov. 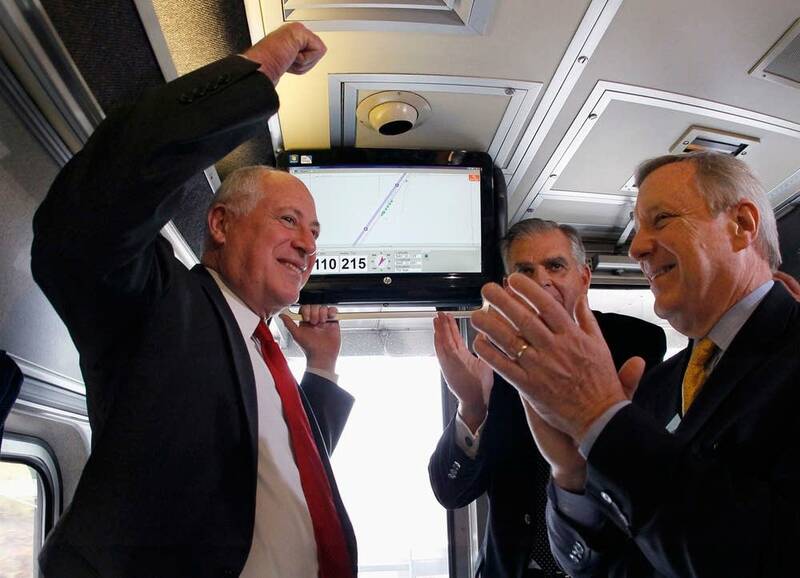 Pat Quinn mentioned the Chicago-St. Louis route in his State of the State address this past week and said it has delivered thousands of jobs. Indeed, Amtrak passengers on that line can look out the window and see workers who have been upgrading track, signals and crossings. Also highly visible are the rail car makers awarded contracts, including the U.S. subsidiary of Nippon-Sharyo, the maker of Japan's bullet trains. Its plant in Rochelle, Ill., will build 130 double-decker rail cars for high-speed projects in Illinois, Michigan, Missouri and California. Less obvious, though, is the business generated for those supply-chain companies identified in the policy center's report. The businesses it found are located in Illinois, Indiana, Iowa, Michigan, Minnesota, Ohio and Wisconsin. They include family-owned firms with humble beginnings like Bo-Mar Industries, a metal fabrication shop in Indianapolis whose founder started it in 1991 in his father's barn. Today, Bo-Mar's work includes cutting sheet metal with lasers and high-pressure water jets. Its rail industry product line includes sleeper car bunks, interior lighting, battery boxes, stainless steel kitchens and bicycle racks. Company President Bob Buchanan, a former Amtrak engineer, notes the economic food chain extends farther still because he subcontracts work to painters and buys from local welding equipment suppliers. "It goes deeper," he said. "I bet we generate $200,000 a year in secondary operations that we send out locally." In Gladstone, Mich., the 30 employees of the Independent Machine Co. do business with Amtrak and other rail companies, supplying them with gear cases, wear plates and the plows attached to the front of locomotives to clear debris from the tracks. The company started in a garage in 1975 with a single lathe used to knock the flat spots out of worn locomotive wheels. "It's very beneficial to us," sales manager Wendy Wils said of the increasing business. "The more locomotives they have out there, the more replacement parts we build."